William Dunlop with his Temple Golf Club Yamaha R1 and Caffrey Yamaha R6 machines. William Dunlop will kick-start his 2018 road racing campaign on the striking red and white Temple Golf Club Yamaha machines at next month’s KDM Hire Cookstown 100. The Ballymoney rider will receive the full backing of former Mar-Train Racing team owner Tim Martin this season, who stepped in to loan Dunlop his Yamaha R1M bikes last year after the 32-year-old’s Superbike deal with Halsall Racing fell through. Dunlop joins a strong line-up already confirmed for the first Irish national roads meeting of the season in County Tyrone, which includes Derek Sheils on the Cookstown B.E. Racing Suzuki, who has won the last four Superbike races held around the 2.1-mile Orritor course. Fans’ favourite Guy Martin is expected to return to the event to compete in the Classic race on his BSA machine. Dunlop, who won the opening Supersport race at Cookstown on his Yamaha R6 in 2017, says he is feeling optimistic for the year ahead after a positive test at Cartagena in Spain earlier this month. “I did five days’ testing and after we left Barry Symmons’ test at Cartagena, we did a day at Calafat as well,” he said. “The weather wasn’t great but I got plenty of miles done, which is a lot more than I managed in recent years. “The R1 I have might as well be a new bike because it is completely different, the power delivery is more smoother and the suspension is different – it’s basically a sister bike to the Raceways Yamahas being used by Tarran MacKenzie and Josh Brookes in BSB. 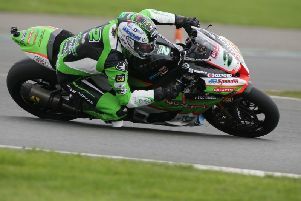 Dunlop is due to compete in the opening rounds of the Bennetts British Superbike Championship, which commences this weekend at Donington Park, as part of his preparations for the major international road races. The Cookstown 100 takes place on Saturday, April 28.